Emilia Lopez-Yanez was born into a musical family in San Diego, California, where she grew up singing, dancing, playing the oboe, and doing just about every musical activity imaginable. She continued to pursue her love of music at Chapman University, where she received her Bachelor of Music in Vocal and Oboe Performance. While she had been teaching her dolls since she was a child, it was during her undergraduate studies that she fell in love with teaching music to children. 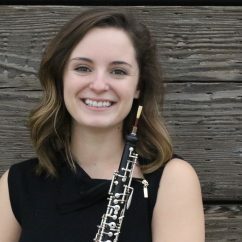 Emilia recently completed her Masters in Music degree in oboe performance at the University of Southern California. Through USC’s Thornton Outreach, she enjoyed directing children’s choirs, teaching jazz, and working with Pre-K classes throughout South Los Angeles in underprivileged schools. She is currently working toward a Graduate Certificate while performing as a freelance artist around Southern California. In 2018, Emilia and her mother created a kids music duo, Ruth and Emilia, and released their first album entitled “The Spaceship that Fell In My Backyard.” Through upbeat songs and silly characters, their goal is to inspire audiences to be their very best, while making the world a better place. When she isn’t singing, playing, or teaching music, Emilia enjoys spending time with her family and friends, traveling, and finding new ways to cook and eat potatoes.